At first I was a bit conflicted when I read about the appearance system. It doesn't directly address the issue of RvR improvements, which is the core of the game. The more I thought about it, the more I liked the idea. WAR may be about killing players (in the face), but you also want to look good while doing it. I don't mean elf "good" either. 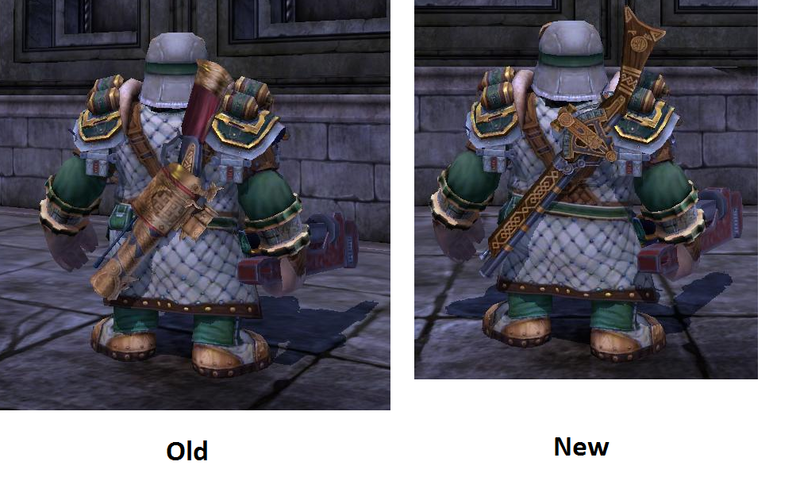 In the May Producer's Letter, the redesigned armor sets were given as a use of the new system. While those are nice, I don't have a preference one way or the other. There are two areas which I do have plans to make some appearance adjustments. The first would be cloaks. 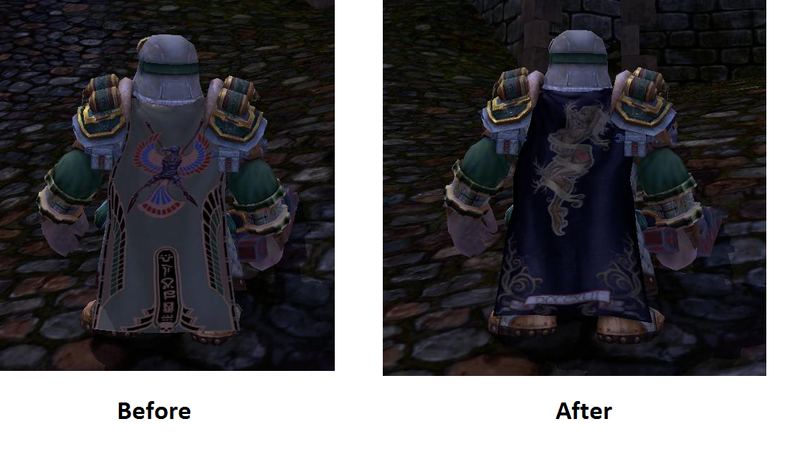 WAR has a bunch of cosmetic cloaks which have some very nice designs. The problem is they do not have any sort of stats on them. They might be good for role play events, but you wouldn't use them during an actual fight. I have had the Shawl of Spring sitting in my bank since a little after launch. 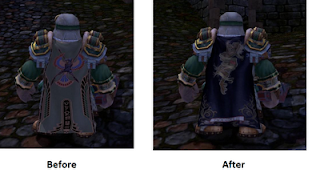 As you can see below, I have my LotD cloak on. It isn't the best looking accessory, but it has some sweet stats. The Shawl of Spring is quite a bit nicer in my opinion. The second change I'd make is my rifle. In the letter, it was mentioned that weapon appearance could also be changed. My current rifle is great on stats, but is using an older weapon model. My previous Invader level scenario weapon just got a new skin, so with this system I could get the best of both worlds. The old image is my current weapon, the new is what my current weapon would look like with the appearance system. Trophies are one of WAR's ideas that never really lived up to its potential. They are just too small to notice, especially in the heat of battle. You know what would make a better trophy? A piece of armor, an armor set or a new weapon model. I think cosmetic items would be great as rewards or new items to buy from a RvR token vendor. Appearance in a PvP game can be a bit tricky. One common concern is that your enemy can gain an advantage by not showing what they are wearing. We may find that Mythic does not show the appearance armor to your enemies. I'm not sure it even matters. Thinking back, I don't remember a time when I cared what the enemy was wearing when going about killing (or trying to) him. The only exceptions are if it was a tank carrying a shield or a DoK using a chalice. Other than that, it never made a difference to me. The appearance system coming in 1.3.6 should be a great addition to WAR. It is something that they will get a lot of mileage out of down the road.